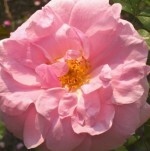 The Explorer roses were developed at the agriculture research station in Ottawa, Ontario and l’Assumption, Quebec to withstand the cold Canadian winters. 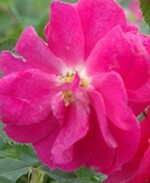 Using Rosa rugosa, R. kordesii, Hybrid Teas, and Floribundas breeders produced roses that had the hardiness and disease resistance of old roses with the beauty and repeat blooming of modern roses. The resulting series consists of about twenty two cultivars named to honor Canadian explorers and includes red, pink, white, and a few yellow flowered plants as well as low growing groundcover, upright shrub, and climbing roses. 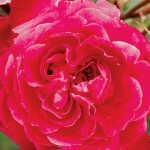 With a Hybrid Tea form, the flowers of this rose are produced in clusters of five to fifteen and have bright pale crimson petals and a raspberry fragrance. The vigorous shrub has large, medium green glossy leaves that are tinged with red when young. 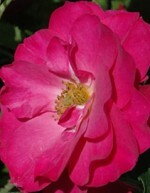 It can be trained as either a shrub or short climber. Repeat bloom can be encouraged by deadheading.. Sir Alexander Mackenzie was a Scottish explorer who in was the first man to traveled overland to the west coast hen he arrived in British Columbia in 1793. 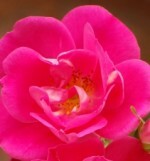 Pointed buds open to flat flowers that are deep magenta to pale crimson before fading slightly to dark pink. Dark glossy leaves clothe lax sprawling brick red stems. 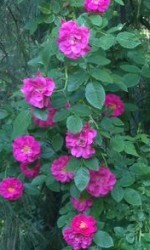 Can be grown as a pillar or shrub; flowers good for the vase. Captain Samuel Holland was Dutch and the Surveyor General of George III. The cupped flowers are produced in clusters of five to eighteen and have bright crimson petals surrounding a center of golden stamens. They fade to rose read before dropping cleanly and giving way to small orange hips in the fall. The foliage is dark green and glossy. The bush produces long arching canes and can be used as a climber or pruned as a shrub. A profusion of light crimson purple flowers are produced in clusters of three to ten for six or seven weeks in the beginning of the season and sporadically through the summer until a big flush in the fall. The arching stems are prickly and densely covered with pale green glossy leaves. They can be pruned to form a shrub or allowed to grow freely into a cascading bush. This was the first rose in the Explorer Series and commemorates the Genoese sailor who first went looking for the Northwest Passage. The lightly scented flowers are carried in clusters of ten to seventeen and are bright pink before fading to light pink with creamy bases. 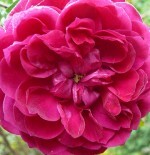 The flowers have an old fashioned form and are sometimes quartered. The leathery leaves clothe prickly stems and are red at first but turn dark glossy green. John Davis was the first navigator to pass through the Davis Straight into Baffin Bay. Ovoid buds open to flat, quartered slightly nodding blooms that are carried singly or in clusters of up to four. 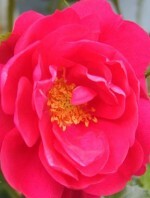 The inner petals are slightly curled and are dark red with lighter reverse fading with age. The leathery foliage is red at first before turning dark green. 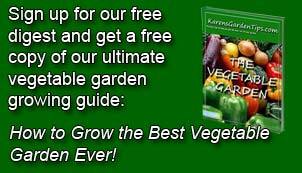 Plants can be used as shrubs, pillars, or climbers against a wall or on a trellis. Flowers are good in the vase. Bodega y Quadra was a Spanish navigator born in Lima Peru, who explored the Northwest coast of America as far north as Alaska. Clusters of ten to thirty deep pink flowers with flat bloom form, white flashes at their base and paler pink reverses are produced on prickly arching stems. The small leaves are thick, glossy and medium green. A good choice for a pillar or trellis. Although resistant to black spot, powdery mildew and rust in Canada, it is less resistant in warmer climates. William Baffin was the English Arctic explorer who discovered Baffin Bay in 1616.